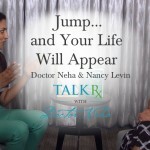 Doctor Neha: Today Nancy Levin is joining me. I’m so excited to share with you some of the lessons about self-trust that we’ve learned on our journeys. Welcome, Nancy. I’m so glad you’re here. Nancy: I’m so happy to be here. Thank you. 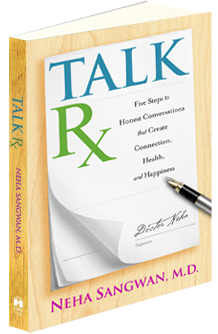 Doctor Neha: I loved when I read your book not only how honest you are, but you also take authenticity and honesty to a new level. Nancy: That was the only way to do it in Jump…And Your Life Will Appear, especially since it’s a ten-step process and the first step is admit to yourself what you already know. It’s really about being able to dig deep with your own truth, because, ultimately, we all think we have to hide something, so whether it’s some skeleton in the closet, secret or some aspect of ourselves, we often think we have to hide something in order to be loved and accepted. I set about busting up that myth. Doctor Neha: I love it. We’re myth busters. The counterintuitive piece is that until you’re willing to show up as who you are, then only will you be able to love yourself and be able to be loved by someone else. Nancy: That’s so true. I often say I was running around living my life by the motto of “never let them see you sweat” and projecting an image of perfection to the world and managing the perceptions of others—with my Superwoman cape, my mask and my armor, muscling through life. I never really wanted anyone to see me, and I didn’t want to see me. Doctor Neha: It’s like you feared that someone was not going to like you if they saw you, right? Doctor Neha: Except if they like you when you walk around being all perfect, it’s not really you. Nancy: That was the big lesson: You can’t really be loved for all of whom you are if you don’t present and express all of who you are. Doctor Neha: There’s a balance. Some people only focus on themselves, and they come across as narcissistic. A lot of people have said to me, “You spend a lot of time talking about yourself,” and I reply, “Well, first of all my stories are the ones I can share. Those are the ones I have confidentiality signed with myself. Also, they’re the ones that resonate so deeply because I feel passionate about them.” Then there’s the balance of being others focused. You were just saying that at some point you decided that the perceptions of others are what gave you value. Nancy: Absolutely. I was running around seeking external validation, and I was really placing my own worthiness in the hands of others. Doctor Neha: So it changes in every room you walk into. Nancy: That’s right, constantly. Until I understood that I needed to first resolve internally what I was seeking for externally, I couldn’t have the connection and intimacy that I actually was longing for because there was that impenetrable armor. When I reached my own crisis point that I outlined very honestly in my book, and the foundation of my life began to crumble and crack and fall away, I had no choice but to take off the mask, take off the cape, let the armor fall and begin to rebuild. That’s the moment—in that transparency—that I first was able to have real true connection. Doctor Neha: The word coming to me is freedom. Nancy: Yeah, ultimate freedom, because I was no longer concerned and overwhelmed and consumed with how I was being perceived. The second step is, “Tell the truth to someone safe.” So once I’m in alignment and living with my truth, I am able to reveal it. I think about the truth like a pressure cooker. You hit that release valve, and the steam shoots up and then the shame and embarrassment and guilt can’t live in the open air. It’s released. I often say that, especially when I was at my darkest point, I found that the people I feared revealing myself to the most were the ones who rallied around me the fiercest, and they became like scaffolding around me as I was able to rebuild. Nancy: Even now just talking about it, I can feel the support around me. We all need that support to be living in our truth. Doctor Neha: I want to mention two things that you’ve said. One is that when you said shame can’t live in the open air, it reminds me of Brené Brown saying that shame grows in the darkness and that’s the only place it can grow. The second piece is the counterintuitive nature of believing that being vulnerable is powerful—those very people you thought were “going to judge you” were actually you judging you. Nancy: Absolutely. Everyone is just holding up a big mirror. Nancy: The other piece of the second step is like building our muscles. When we’re speaking to someone safe and revealing something that we’ve been hiding, I coach my clients to give the person with whom they’re sharing a script of some sort of what they want to hear in return. My dad said, “Well, we already told you that we love you.” I replied, “Dad, I never questioned that you love me, but what I was listening for and hoping for and praying for but not telling you was that you’d say, ‘I’m proud of you. '” He was like, “We are proud of you!” My mom’s like, “Me, too! We’re proud of you!” It was that moment when I had to tell people what it is that I needed from them. Nancy: People are not mind readers. It’s like the love languages. What’s the way that I know that I’m loved? And is it different from the way that I give? Communication is very similar. I love that you shared the story because I have a similar version of the same story. Doctor Neha: Tell me; I want to hear it. Nancy: Way back when I lived in New York and had left my very glamorous job at Condé Nast Traveler Magazine—my mother could hold up a magazine and say, “Here’s what Nancy’s doing”—I left the job. Then the response was “What are we going to tell people that you’re doing?” When I decided to move to Boulder to do my master’s in poetry, my father really was rooting for the underdog in me. He’s a dentist, and he has been doing it forever. She met me with, “You’re awesome; you’re amazing. You can go do anything. That’s great.” It was shocking to me, because I had been in this place for months of anticipating the same old fear-based questions of, “What am I going to tell people? How are you going to make money? What if it doesn’t work? What if no one buys your book? What if no one coaches?” My fears were just being reflected. That was really a lesson in how we are magnets. The energy we put out absolutely … comes back to us, for sure. Doctor Neha: I love that story, and now I’m going to tell you one more. When I was a hospital doctor—traditional white coat, working five days on and five days off—I started teaching communication. I was so excited they were going to pay me. Medical teams in hospitals don’t really think that something other than drugs, surgery, and seeing patients is something that you get paid for. There’s this stigma that’s like, “Oh, that’s fluff time.” If you become a leader, it’s like you’re bailing out on your responsibilities as a doctor. Meanwhile, leadership and creating change is such an enormous, needed skillset, but there’s no real appreciation for the people who are on the ground doing the work. They were like, “Yeah, let’s go.” We didn’t drag on it. It wasn’t the same conversation. If somebody questions you and you don’t really believe it, do you ever find yourself listing out why it’s true? Nancy: Of course, it comes back to this question of our own worthiness or what we think we deserve or what we think we have to give someone else as an excuse or a defense of who we are. This comes up a lot in truth telling, because we’re often then at the point of boundary setting. “No” is a complete sentence. Doctor Neha: I love that. It is a complete sentence. Nancy: Yet so many of us do this listing-off thing, and it doesn’t need to happen. Doctor Neha: There used to be this belief that you were handicapped or needed help if you got a coach. When I work at corporations and they ask, “Did I do something wrong that you are being hired to help me?” I always say to them, “It is the best-kept secret. It is a competitive advantage in every situation.” If someone’s paying for you to have a competitive advantage, however you got here, this is your moment. Nancy: Yeah, it’s a secret weapon. Doctor Neha: It’s like a secret not-so-secret weapon. It’s in plain sight, but people have these limiting beliefs around it. When you left Hay House, you went out and started coaching. Nancy: I did. I had been coaching as my side hustle. Doctor Neha: It was your true love. Nancy: It was my true love. I fell into coaching because I have gone through my own personal transformation and then through a yearlong coaching training program with the late Debbie Ford, my dear friend and mentor. At that point I still never intended on coaching, but I wanted to do it to continue the deep inner work that I had been already been undertaking. At the end of that year-long program that was more rigorous than my master’s degree, I was unrecognizable from the woman who began. In that moment, I knew I was here to help other people get free. Doctor Neha: One of my mentors once said to me, “There are two kinds of people, the people who are scared and don’t climb mountains and the people who are scared and do. Which one are you?” After hearing that, of course the competitiveness in me was like, I climb mountains even if I’m scared, but I think what I really learned was it’s a short-term/long-term thing. Am I going to choose to be scared in the moment, face something, and move through it and find peace on the other side, or at least some learning on the other side—or am I going to hold back and have that fear with me and that doubt for the long haul, and just avoid dealing with it in the short term? The truth is if you choose the short-term comfort, you’ll actually have to now deal with long-term consequences when you’re not sleeping anymore, when you have anxiety, when you have depression? Because it manifests in your physical self. Doctor Neha: My angle on working with patients over a decade was realizing that when these things are not addressed, they end up showing up physically. Doctor Neha: …no longer serving us. Nancy: … abusive, whatever it is, because there’s some comfort in the familiar. We fear going into the place that we don’t know. What we have to remember is that in the unknown, in the uncertain, that’s where possibility and opportunity is born. There is this place between no longer and not yet, this space that we really have to respect and revere because that’s where our resilience comes in. Doctor Neha: And that’s sometimes uncomfortable in your body. Doctor Neha: Self-trust comes is trusting that you’ll figure out what comes next, not needing to know the whole plan but trusting that you have the support system around you to help you figure it out. Nancy: I often say the other piece of Jump…And Your Life Will Appear is that, as you land, the new foundation will form beneath your feet for you. Doctor Neha: What a beautiful visual. I love this. You are such an inspiration. Nancy: Thank you. You too. Doctor Neha: Thanks. If any of you are looking to take that next step toward more self-trust in your life, what I can tell you is both of our books (TalkRx and Jump and Your Life Will Appear) are chock full of practical tools and ways to help you take that next step in your life, that one that you know you’ve wanted to take but you’ve been saying, “Not now. I don’t have enough money. This isn’t the right time.” Guess what? You’re watching this, and it is the right time. Send me your questions—drop me a tweet at #askdoctorneha or write your question and comments down below.